their own unique workflow- but every office shares the ability to categorize duties by either patient workflow and/or department. Think about all the duties in your practice. They can either involve interaction with a patient or a specialized duty performed by a department in your practice. Although these duties may coincide in both patient workflow and department, categorizing them in this manner will force you to see your staffs' daily routines from two different perspectives. Creating your procedure manual will paint a bigger picture of your workflow and allow you to visualize your systems critically, and all at once. The procedure manual I am suggesting should be a read-only document, but it should link to shareable manuals, guides, and files. These files should be shared with the appropriate people or departments responsible for contributing to the manual. Populate the individual “How to” guides. Grant access to the appropriate people or departments responsible for contributing to the specific “How to” guide and start creating the guides. For those who are not directly contributing to the document, but who are involved in a certain procedure, you can encourage suggestions on how to improve procedures and systems. Categorize each “How to” guide. In my template below, you can see some examples of how workflow and departmental duties are categorized. Quicktip: A patient workflow duty/guide will always be a part of a departmental duty, but a departmental duty will not always be part of workflow. Create a Procedure Manual that categorizes and links your “How to” guides. Although there are variances in the way offices are run, most Practice Management (PM)/Electronic Health Records (EHR) software are designed to run only one way. You either use it right- or you use it wrong. It is best that you learn the way a system was designed first and then implement that into your training/procedure guides. Once that is accomplished, you can tweak your workflow around your software and reassign, delegate, and/or eliminate tasks. By implementing your software the way it was designed, you can take advantages of future integrations and new features. If you don’t prepare for it now and a new software feature is released, you may have to backtrack through your implementations anyway to get those new features to work. Trello is a very flexible and powerful tool that allows you to organize practically anything. Work or play, this intuitive system can be easily used to make to do lists, meal plans, and even your Procedure Manual. The company, Trello, uses its own tool for their employee manual. See it in action HERE. This option was mentioned to me by an OD on Facebook. Personally, I have never used it, but I find that $25/month + $8/month per user very costly for a system that only does one thing, whereas Google Apps, Coggle.it, and Trello can be used for multipurposes. See it in action. I’ve tried the first three solutions, but unless everyone on your staff is tech-savvy and welcome to change, the outline version will almost always be the easiest to implement since it will be the most familiar. In my next article, I will show you how to create your clickable Procedure Manual on Google Drive step by step. Looking to create your own Procedure Manual? In my last article, A "Clickable" Procedure Manual, I showed you how a clickable manual could be used in your office. 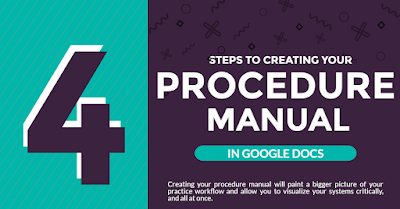 This guide will show you how you can make a procedure manual from scratch using Google Documents. It is a fairly simple (but lengthy) process and you will need to be familiar with my previous Guide on Making a Guide on Google Docs before proceeding. The VSP Interface in Officemate has come a long way from when I implemented it three years ago. You can find the latest VSP Interface checklist on page 483 of Officemate Administration v12.0.3 Guide. The newest implementation method provided by Officemate is a module called the VSP Setup Assistant and it walks you through each step to get VSP Interface up and running. © 2011-2016 Charles Aquino. All Rights Reserved.